It is frequently claimed that 90 percent of Americans support the expanded background check bills that are being considered before different legislatures, though other surveys indicate that support for the actual bills is below 50 percent. 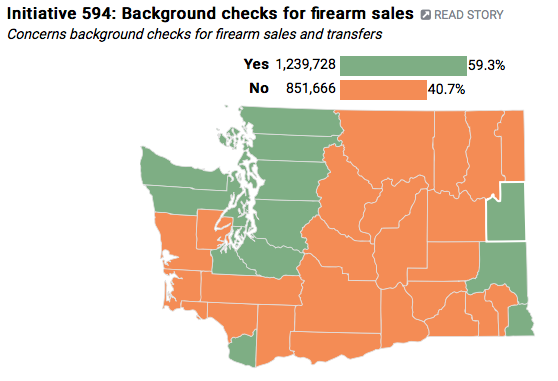 Well, gun control advocates were able to write up their own initiative (594) and put it on the ballot in Washington State. With what may turn out to be a 50-to-1 spending advantage ($9.5 million to what appears to be a couple hundred thousand ($1.7 million was spent on another gun initiative)), the initiative passed with 59 percent of the vote. What this vote implies is that even under ideal circumstances with a massive campaign spending advantage and picking a liberal state where they thought that they would do well, slightly less than 60 percent of the voters supported the initiative. Why do gun control advocates feel it necessary to so greatly exaggerate support for their initiatives? It will be interesting to see if the 90 percent claim keeps being made. A copy of the literature put out by proponents of this initiative is available here (includes their estimate that the initiative will add up to $60 on to the cost of transferring a gun).